What’s next for the Mariners’ step back? Or is it, who’s next? 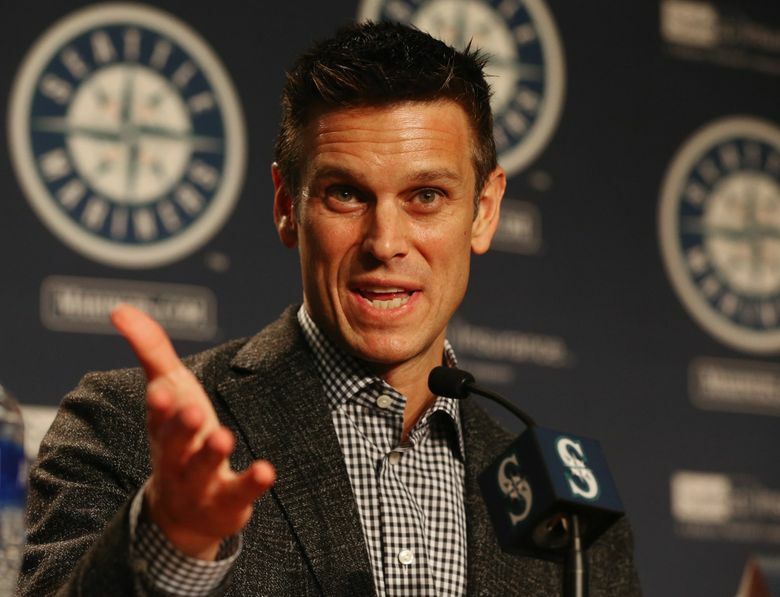 GM Jerry Dipoto has made five trades this offseason and he's not done. Who could be the next player traded? So what’s next for the Mariners? It’s become very clear in the Mariners’ “step back” that general manager Jerry Dipoto can and will trade any player. It was just two weeks ago that Dipoto told writers on a conference call that he would prefer not trade to Edwin Diaz, Mitch Haniger or Marco Gonzales. But Tuesday, Diaz, along with Robinson Cano, were introduced at a press conference at Citi Field in Flushing, N.Y., as the newest members of the Mets. Dipoto admitted he didn’t anticipate being able to find a trade partner for Cano this offseason or that he would deal Diaz, who was under four more years of club control. But once he started culling his roster with separate trades that sent catcher Mike Zunino to the Rays and left-hander James Paxton to the Yankees, the rest of baseball understood the Mariners were open for business and started making offers. And now, he’s made five major trades this offseason and there is an expectation more will be made in the coming weeks. That’s a combined 663 games played and 4,005 2/3 innings logged but just 17.3 Fangraphs’ WAR. Expect that list to grow. It’s impossible to imagine Dipoto being done with this roster reset and makeover. He did say they might take slight breather for a few days after the flurry of the deals with the Mets and Phillies. Of course, that’s only about a six-day break. There will be no gambling or cliches needed once the Mariners roll into Vegas. They will be open for business. Though it is amusing to think about Dipoto, Scott Servais and rest of the front office standing in front of the Bellagio Fountains like the near the end of “Ocean’s Eleven,” quietly pondering whether this whole plan will actually work. So who is next to be traded for the Mariners? Looking at what is left and what has been added, there are more than a handful of candidates who could be moved. The most valuable trade chip the Mariners possess is Haniger. He’s coming off a breakout season where he played in 157 games, posted a .285/.366/.493 slash line with 38 doubles, four triples, 26 homers and 93 RBI. He was the Mariners’ best and most consistent player all season. At age 27, he’s still under club control for four more seasons before becoming a free agent in 2024. He’ll make the MLB minimum in 2019 and then enter three years of arbitration. Even if he continues to produce at a high level, the arbitration salary he could potentially earn would still make him a bargain to any team. Teams have already called on Haniger and he would be a perfect fit for the Braves or other teams like the Giants, Nationals, Indians and even Rockies could benefit from a cost-controlled outfielder. It’s instructive to note that Haniger turns 28 on Dec. 23. It means he’s similar to the same age as Segura, who the Mariners just traded. Part of Dipoto’s reasoning for moving Segura was how old he would be when the team’s step back is supposedly finished and when the roster is projected to be primed in 2021. Haniger would be 31 at the time. But the organization believes he will age better than Segura due to his dedicated, almost obsessive, commitment to preparation in the offseason and during the season. They also believe he will be the type of player that young players could imitate and learn from when it comes to handling their day-to-day business of being a professional. And yet … if a team is willing to offer three players for him, including a top pitching prospect that is close to big-league ready and a hitting prospect with power potential that could play a corner infield or outfield spot, Seattle should explore trading him. If you were willing to do it with Diaz, you can’t be afraid to do the same with Haniger. The absolute worst possible thing the Mariners could do is try to attach Kyle Seager to any deal involving Haniger. It’s something they managed to pull off with Diaz and Cano, but the circumstances were different. New Mets GM Brodie Van Wagenen had a prior relationship with Cano as his agent, which helped the process. Trying to get another team to take on even half of the almost $60 million owed to Seager over the next three seasons could significantly limit the prospect return in the deal. Seager is coming off his least productive season where he slashed .221/.273/.400 with 36 doubles, 22 homers and 78 RBI. His value is at the lowest point in his career. The Mariners want to trade Seager and move on from his contract, which is understandable, but using Haniger to do it would appear to be a salary dump and not a true move to improve, regardless of the payroll flexibility it might provide in the future. No, if you are going to trade Haniger — a player you believe could be the core leader for this step back/rebuild — then you have to the maximum in return. As for trading Seager, the Mariners should be willing to eat at least half of the dollars owed in the form of cash or a return of a player with a fair amount of money owed. The smarter gamble might be to keep Seager if no great move materializes and hope that he bounces back from his past struggles. If that happens, you can move him at the deadline to a team in need or even after the season. While Gonzales is often listed with Haniger and Diaz as being players the Mariners hoped to avoid trading, his value isn’t quite as high as the other two. Perhaps it’s a bias toward lefties without a high 90s fastball and exploding stuff. Gonzales had a breakout season in 2018, posting a 13-9 record with a 4.00 ERA in 29 starts. He struck out 145 batters and walked just 32 in 166 2/3 innings. But a team isn’t going to give up premium prospects for a pitcher who projects more to the middle or backend of a rotation. Another strong season from Gonzales could push him higher in a rotation, but for now he’s got more value to the Mariners than to other teams. Two other candidates to be traded this offseason are right-hander Mike Leake and second baseman Dee Gordon. Both of their contracts are up after 2020, so they don’t really fit Dipoto’s step back timeline. Any deal for Leake might come after the free agent pitching market shakes out and teams have a better understanding of the pieces in their starting rotation. While far from dominant, Leake still has value to teams in his durability and quantity of innings pitched. He logged 31 starts and 185 2/3 innings, while going 10-10 with a 4.36 ERA last season. He is more than capable of being a decent back of the rotation starter, particularly in the National League. He’s owed $21 million over the next two seasons with a $5 million buyout for an option in 2021. That’s not an insignificant sum. Look at it this way, would Mike Leake get a two-year, $26 million contract as a free agent right now? Any player or prospect return would be contingent on how much of Leake’s contract the Mariners are willing to eat. Leake also has a full no-trade clause, which could limit his market. Gordon isn’t without talent. Multiple opposing scouts believe his struggles in 2018 — a .268/.288/.349 slash line with 17 doubles, eight triples, four homers, 36 RBI, 30 stolen bases — were due to playing almost the entire season with a fractured right toe he suffered in mid-May, a regression in his swing-first approach at the plate and the Mariners continuous shifting of his positions on defense. Multiple teams have question marks at second base. Gordon, who won a Gold Glove there and was an All-Star performer in 2015, could fill that role. He’s owed just over $26 million over the next two seasons with a $1 million buyout of his 2021 option. As with Seager, the Mariners might benefit from having Gordon play the first half of the season and hope for a strong start to increase his trade value. And there, of course, are the three veteran players the Mariners acquired Monday in the two trades. Would you really want to bet your paycheck whether first baseman/designated hitter Carlos Santana, outfielder Jay Bruce or reliever Anthony Swarzak makes it a full season with Seattle before being moved? Bruce was told he was going to be with the Mariners on opening day. Bruce, 31, is owed $28 million over the next two seasons. He dealt with a hip injury for much of 2018, playing in just 94 games and hitting .223 with a .680 OPS, 18 doubles, one triple, nine homers and 37 RBI. Now that he’s fully healthy, if he can put together any sort of a bounce-back season similar to his .832 OPS and 36-homer production in 2017, the Mariners will try to trade him for something in return. A MLB source said that the Mariners could trade Santana to a handful of teams before the offseason is over. “They are almost certainly going to flip Santana at some point, but they might be better off waiting till the deadline and hope he has a strong first half,” the source said. Santana hit .229 with a .766 OPS, 28 doubles, two triples, 24 homers and 86 RBI in 2018. But he was a plus.800 OPS hitter the previous two seasons. Swarzak, 33, is owed $8.5 million in 2019 before becoming a free agent. He will most likely be moved if a deal can be made. After a strong 2017 season, Swarzak struggled in 2018, posting an 0-2 record with a 6.15 ERA while dealing with an oblique strain. Now completely, healthy, Swarzak could be easily moved if he pitches well early in the season. Asked if Bruce and Santana would be with the team at spring training, Dipoto said he expected they would be there and could aid in building a culture in the clubhouse, but then couched his assertion. What’s next for the Mariners? It will be more moves in an effort to follow the step back plan Dipoto and ownership has implemented. It’s not a matter of when, but whom.